With all the hassle and bustle of everyday life, it can be difficult to keep a home clean. You get home and have a meal to end with a meeting just a little later. The next day holds appointments while you watch the home get just a bit more messy. An unexpected call takes the next day away from cleaning the house. When does it stop? Here is a hint … Kensington Chelsea Cleaners. Our cleaning company offers very affordable domestic cleaning service. Our staff have been highly trained in the cleaning of homes from top to bottom. Every nook and cranny will be checked for dust, dirt and grime. The staff have learned to clean those areas that just make you wince. All the while, they keep a smile on their face. Our cleaners use ecologically friendly solutions. You can feel good that you and your family will not be breathing toxic chemicals after our domestic cleaners perform. You will breathe a fresh, cleanliness that will make you feel less stress knowing your home is clean once again. You will probably want to throw a party to show off your clean home. Our cleaning company works with your schedule, we don’t expect you to work with ours. Our domestic cleaners know how to work fast and accurately. They are standing by ready to clean your home. 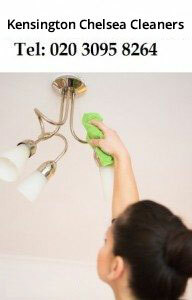 We can also adjust our cleaning prices to fit your cleaning budget. Just contact 020 3095 8299 today and we will schedule our fast and sure home cleaners to your address immediately.